Ebook Readers - Are You Ready to Leave the Paperbacks at Home? With Amazon’s new ebook reader, Kindle, already sold out after only one day on the market, is the writing on the wall that techy travelers are ready to leave the paperbacks at home? For the book loving gadget geek considering going electronic, here are a few of the digital options available. 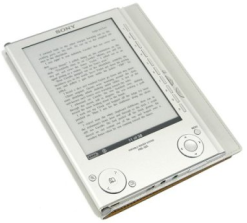 Sony was one of the first to provide techies with a new way to experience reading. Boasting an impressive 6-inch display that is easy to read even in bright sunshine, the popular ultra portable reader weighs just nine ounces (without cover), is only half an inch thin8 and holds up to 160 eBooks4. And, with its rechargeable battery you can turn up to 7,500 continuous pages on a single charge - enough to read The Da Vinci Code 16 times before recharging is required. With plenty of internal memory and a slot for optional removable memory cards, you can take hundreds of titles, user-selected Web content or other supported documents for reading on the go. The device connects to a PC for purchasing and downloading electronic books from an online store with 20,000 titles, or digital texts can be uploaded using a memory card. The unit has an integrated music player that is compatible with unencrypted MP3 and AAC formats, and it supports Word documents, Adobe® PDFs, and JPEGs. 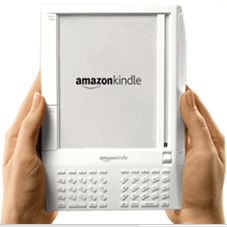 7” L x 5” W x 1/2” D.
Three years ago, the folks at Amazon set out to design and build a convenient, portable reading device with the ability to wirelessly download books, blogs, magazines, and newspapers. The result is Amazon Kindle. Utilizing a new display technology called electronic paper, Kindle promises a screen that is sharp and natural minus the strain and glare of a computer screen. Kindle is also designed for ambidextrous use so both “lefties” and “righties” can read comfortably at any angle for long periods of time. One of Kindle’s nicest features is that Amazon made it wireless. No PC and no syncing needed. Using the same 3G network as advanced cell phones, it delivers your content using their own wireless delivery system, Amazon Whispernet. Unlike WiFi, you don’t need a hotspot. Better yet, there are no service plans, yearly contracts, or monthly wireless bills. With Whispernet, you can be nearly anywhere, think of a book, and get it in one minute. Similarly, your content automatically comes to you, wherever you are. Newspaper subscriptions are delivered wirelessly each morning. Finished your book in the airport? Download the sequel while you board the plane. With Kindle’s paperback size and expandable memory letting you travel light and the freedom to download what you want, when you want, is it any wonder it’s selling like hotcakes? Differentiating it from other readers, the iLiand not only lets you read anything you like, exchange documents, receive new content and sync with your PC, its pen-like stylus lets you make notes or add comments to your documents. While perhaps not quite as easy as Kindle’s innovative wireless capabilities, the iLiad also has a WiFi connection to automatically download content and updates over the Internet. 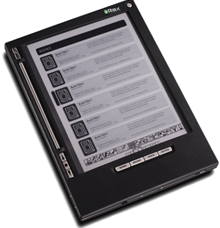 The iLiad can hold dozens of books and documents and memory capacity can be increased simply by inserting a Compact Flash or MMC card, just as with digital camera. You can even insert your USB-stick into the iLiad to quickly read content. Looking for a user friendly, versatile, and customizable eBook reader for the PDA or smartphone you already own, or are looking for an excuse to buy? 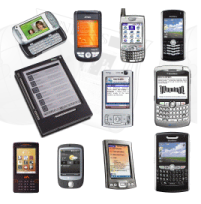 There’s probably a Mobi Reader for it : PalmOs, Windows Mobile, Symbian (Series 60, Series 80, 90, UIQ), Blackberry, Franklin, iLiad (by iRex), BenQ-Siemens, Pepper Pad… And if you have a Symbian smartphone a Franklin an iLiad a BenQ-Siemens or a Pepper Pad. Good News: There is a good chance that Mobipocket Reader is already preinstalled on your device. Bad News: Mobipocket does not currently support iPhone, and iPod Touch. Project Gutenberg - the first producer of free electronic books offers an online library of more than 17000 free ebooks produced by tens of thousands of volunteers. Mobipocket - choose from more than 40 thousands titles available : novels, series, dictionaries, professional titles at this Amazon subsidiary. CyberRead - carries over 40000 from both major and independent publishers. Ebooks - a leading online source of ebooks, with 102,000 popular, professional and academic ebooks from the world’s leading publishers. Diesel ebooks - Over 35,000 titles in 50 categories. Don’t miss the free download section.